One bottle of Elmer’s glue, paste will not do. A quick squirt of your granddad’s Barbasol shaving cream. None of that gel stuff. Two or three squirts of food coloring, and some glitter if you want to clean your house for a month. A couple cap-fulls of Tide laundry detergent to start the alchemical connection. And a level 5 summoning spell, because the wizard surely did it. Fine, that’s actually the recipe for the slime that my daughters are always concocting in our house. Seriously, we have so many plastic containers of this stuff it’s ridiculous. But it is undeniably a trend. In fact, you may have noticed slime-making kits on a Target endcap. It’s been so popular that Elmer’s has been able to create a whole new category of usage for it’s iconic and ubiquitous glue. But are my daughters’ slime like the slimes from old school D&D? Well, I put a couple of my Wizkids minis in my daughter’s slime and they weren’t dissolved at all, so can we trust the Monster Manual on this? Let’s wade into the goo to find out. Zelda 2 was almost certain inspired by Dragon Quest, the game that was remade for the NES as Dragon Warrior. That video game series was up to to its eyeballs in goo, featuring a full array of slimy little boogers like fire, poison, and metallic slimes. 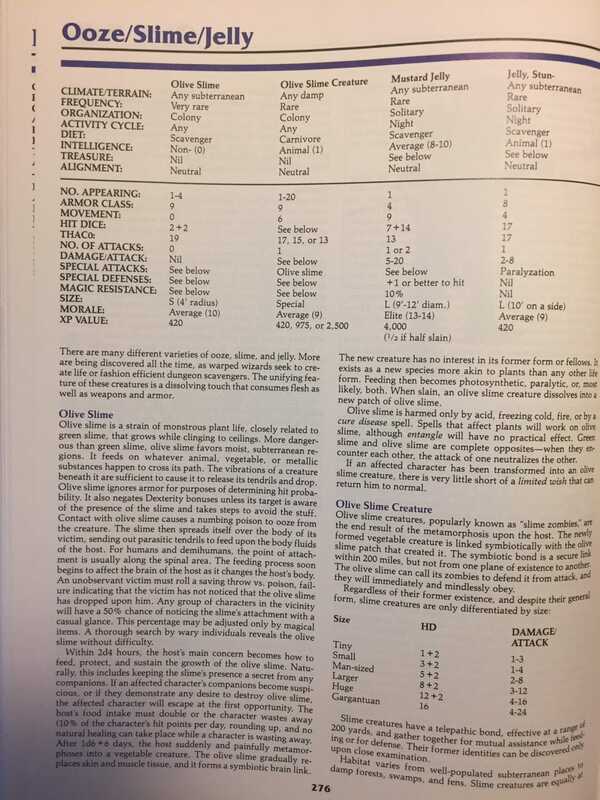 But D&D was first in creating a full assortment of slimes. The green slime first appeared in the original 1974 Dungeons & Dragons set. 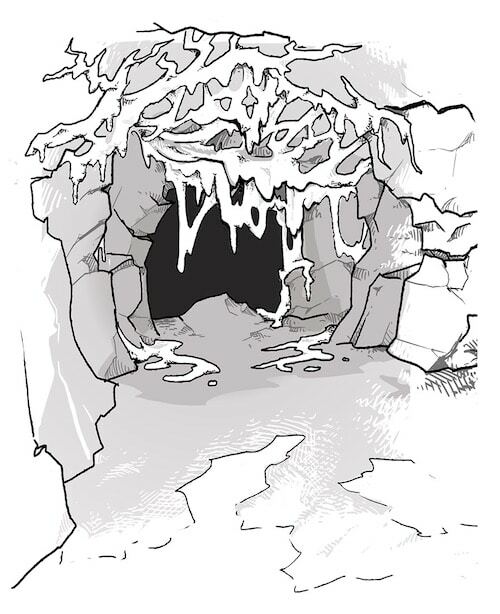 Categorized as an ooze, the green slime was a fetid bright green, sticky, wet moss that would grow on the walls and ceilings of caverns and dungeons. A green slime might grow on a ceiling, only to drop onto those who pass below, potentially turning them into a green slime themselves! Fortunately, a cleric’s cure disease spell could save the day. But good luck fully eliminating it from a cavern. A green slime can regrow if even the tiniest residue remains. 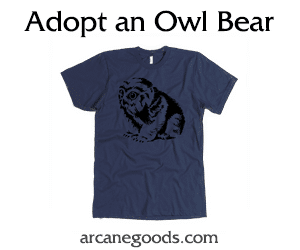 So, adventurers were wise to burn them out. The concept of an invasive slime that overgrows its victims has roots in science fiction, such as the 1968 film The Green Slime, and Gary Gygax loved to pull inspiration from popular fantasy and science fiction. 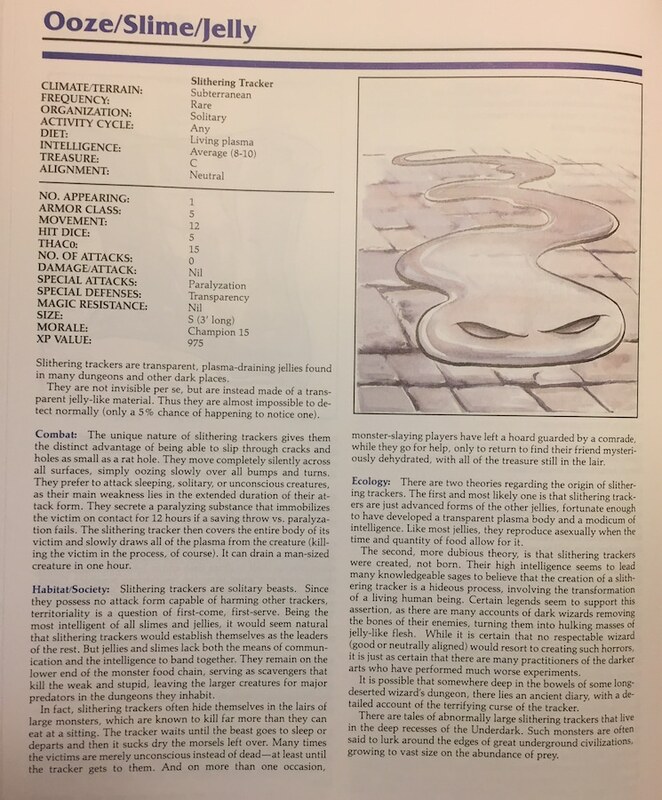 Gygax’s early renditions were talked about as monstrous single-celled organisms, so it’s almost like he took inspiration from both horror movies and junior high science class, mashing it up into a creature creation that would become so iconic that it has “stuck around” 40 years later. So, the wizard did it. Of course. This reminds me of the bio-geneticists at the University of Minnesota that are always genetically modifying apples to create new flavors to match my beloved Honeycrisp. Being that I’m going apple picking later this fall, you can be sure I’ll be keeping an eye out for wizards as well as for rogue slimes hiding up in the trees, waiting to drop down on me. 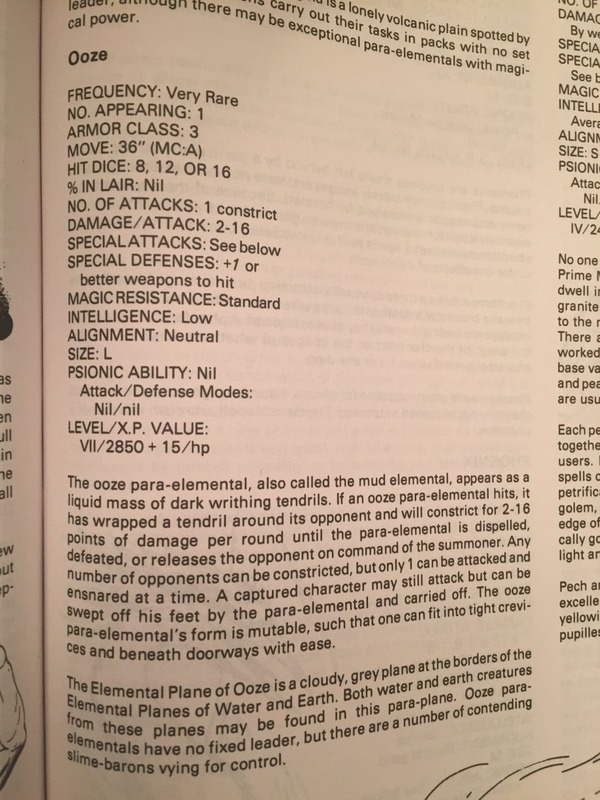 Regardless, what the wizard Gygax first concocted for D&D was an doozy of an oozy! Then, as this article slowed crept into other types of oozes, jellies, slimes, ochres, and more, it started “seeping” everywhere, so let’s “stick” this landing. 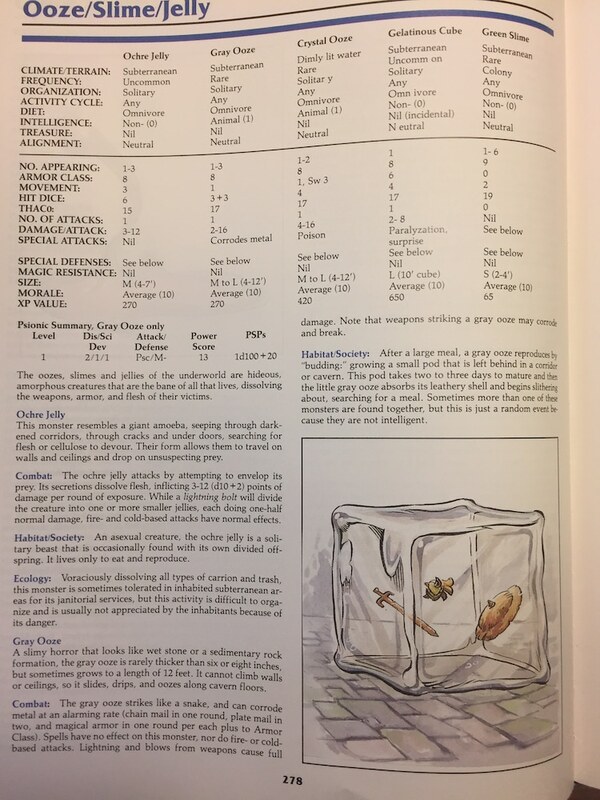 In D&D 5e, slimes are everywhere, just as they have been in all D&D editions. In fact, their origin has taken another interesting turn, deep into the pit of hell itself. The Out of the Abyss adventure and Mordenkainen’s Tome of Foes reminds us that the demon lord Juiblex is called the Faceless Lord and the Oozing Hunger in ancient grimoires. The demon lord of slime and ooze, Juiblex is a fetid horror, as mass of bubbling green and black slime with glaring red eyes that doesn’t care about what kind of Elmer’s Glue slime my daughters are working up in my kitchen. But I can confirm that cleaning that stuff out of my living room carpet is indeed an experience straight from the gates of Hell.